Inverters and the 5 Times Battery Rule? A 3,000watt Inverter can draw up to 290amps (including conversion losses) from a 12v battery, more than a car draws to start the engine. It doesn't take much to realise that this is going to place an enormous strain on old fashioned Leisure battery that was designed to provide just few amps over weeks. There is an excellent document from Victron Energy about batteries and charging, it is called Victron Energy Unlimited, which you will find on the "EHU Full Time ? Yes or No" page, which notes that where a current draw of 300 amps is required, the correct size battery bank (to ensure adequate battery life) is five times the power draw converted to Ah. i.e 1,500Ah or 15 x 100Ah batteries. Many Starter 100Ah battery technologies will supply 300amps for a few seconds without damage, but if you drain a 100Ah AGM/Gel Leisure battery with that sort of current for more than a minute, temperatures at the battery plates will soar, degrading the battery significantly. It will work, sort of, but battery life will be very short. The Exide battery guide book, which follows most other battery manufacturers guidelines, suggests that, for maximum life, a Gel battery draw and charge should be no more than 10amps per 100Ah. Most manufacturers say wet acid batteries can go outside this up to 20 amps without too great a compromise on life versus usability, but go above this for either charging or continuous power draw and the penalty is a shorter battery lifetime. While 10 degrees doesn't sound much, this Battery Temperature chart below shows how exceeding a 20A discharge/charge rate can drop life from 7 - 10 years to just 4 years. 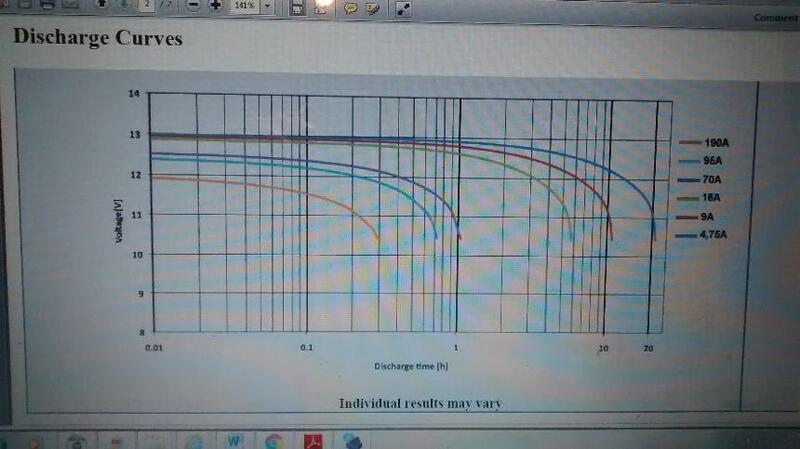 The same heat is generated at the Plates from both charging and discharging so the same degeneration results. Remember these batteries in the charts are not budget Platinum's, but extra high quality, 10 year life batteries, yet even they are badly harmed by fast charging or continuous 'high' current draw. Go above 20amps and temperature at the AGM battery Plates can reach 40 degrees and life is halved again down to 2 years. If you are operating the battery in Southern Spain where it's temperature started at 30 degrees, you can see why we don't rate AGM and Gel batteries. Wet/Flooded batteries won't be impacted so much. To keep below the 20 degree/20amp ideal would require a 100Ah battery for every 20amps that will be drawn, or what is now called the 5 times rule. We asked it what size battery bank we would need to run a 3000w Invertor for 15 minutes twice a day. The results were not dissimilar to The Victron guide. At £200+ per battery for pretty much 5 of the Industrial monster batteries, is a 2 year running cost of £1,000 in batteries alone. We suspect that if more conventional batteries were used the bank size would need to be near the 1,500Ah quoted by Victron Energy? I think you can guess what will happen if you use a 3,000watt Inverter off 2 x 100Ah batteries? What we normally see is batteries become annihilated from the use. By that we mean the battery Plates will suffer serious structural damage which can then take out the mains 240v charger followed not long after by the Alternator. Consider also the load placed on the poor Mains Charger and Alternator, that has to put back all that power that was taken out by a Microwave or whatever. It is a load they were not designed to take, nor is the wiring infrastructure. See the bottom of the page for info on Alternator capability and why a 180amp Alternator should be run at no more than 100amps when the draw is continuous. However, just as important is the 'additional' loss of battery capacity when connected to an Inverter that draws large currents. As the current drawn goes up so the available capacity in a battery goes down. So while you might get 95Ah out of a 95Ah battery if you discharge it at 9.5amps for 10 hours, if the current goes up to 190amps it may last just 0.3 hours, with a 95Ah battery only giving up just 57Ah. See the chart below of a how a Varta LA95 battery performs dependent on the load for more info. We think Inverter retailers should be more clear (honest?) on the real impact of their power units on a battery bank. Some Inverters up to around £500 can be a risk to life. We are all so used to the mains being rock steady and reliable, that many of us take it for granted it is the way all 230v will be. The National Grid has sophisticated infrastructure in place to ensure voltages remain within strict limits. But that stability of voltage isn't guaranteed from an Inverter. While marketing blurb for most inverters will list lots of safety features for the 12v 'input' side, like under voltage protection (typically 11v) or over voltage protection (typically 15v) and short circuit protection, there is rarely anything listed for the 230v side. Yet over voltage protection that shuts down the Inverter if the voltage exceeds 255v would not be hard to include on even the cheaper units. Some we have opened don't even have a fuse protecting the 230v output side. By law our Home 230v electrics must have an RCD and Breakers protecting us from potential tragedy. The Residual Current Device (RCD), is a life-saving device designed to prevent a person from getting a fatal electric shock if they touch something live. A Motorhome 'fixed' Inverter installation should have the same protection, but rarely has. One option of providing over voltage protection around the vehicle is to use the '3 x 16a Plug/Socket' solution we have documented previously, but this doesn't feed direct into the RCD. A '230v mains Condition' sensor device installs before it goes into the RCD, like the Powermaster. This device filters out, and even interupts any poor power events like over voltage, under voltage, Spikes, Surges, etc. before they go into the RCD. Obviously protecting all the vans 230v devices. Because it sits in front of the RCD it stops both 'Mains' issues and Inverter issues, like lightening strikes, mains power surges, etc. not just Inverter internal failure, etc. It is important that the device you choose isn't just a Spike Surge protector, but actually disconnects the mains if it senses a high voltage issue. The Solatek AVS13 would be useful to protect an Inverter with a single 13a plug output, as they are just 'plug and go' solutions. If it senses a mains issue it disconnects it for so many seconds then samples the supply again and if it's back to normal, automatically reconnects it. If it isn't back to normal, it continues to isolate it, waits, re-samples, etc.. It is no secret that we think Inverters are not suited to installation in a motorhome, unless the motorhome owner understands, in great detail, the risk and issues. Note that a Microwave rated at Class E - 900watts is describing the energy it puts into the Food. To create that 900 watts the Electronics will consume a lot more power as they are not 100% efficient, in the case of my own microwave it draws 1,450watts from the mains to produce 900watts 'heating' energy. Some can drawn a 'Start Up' current higher than their running current for a few seconds of starting. Note that when recharging batteries or supplying power for Inverters from the Alternator, the Alternator power rating should be regarded as 'peak' output only, it's continuous rating will be much lower. However, it cannot produce this amount of power for more than a few minutes without overheating and potential damage. The most power that such an alternator can be expected to provide continuously is about 1/2 the maximum rated output power -- maybe as much as 2/3 for a "heavy duty" design. Bosch have introduced a new range of Alternators for Trucks that has inbuilt temperature monitoring because the growing trend of failure of Alternators burning out due to 'Habitation area' overload of the battery by all the overnight kit which is becoming the norm in big Trucks. Items such as Kettle, overnight Diesel heater, interior lights, microwave, etc and the Inverter to run it all. That suggests the problem is significant? b) Inductive loads like microwave ovens and AC motors run faster, quieter, cooler and more efficient. • Computers, Laser printers, photocopiers, magneto-optical hard drives. Modified sine wave works ok for many devices, and is the most common type of inverter on the market, as well as the most economical, but can damage some multi stage Battery Chargers.If you mostly want to run lights (none ballast), TV, kettle, heater, etc, a modified sine wave inverter is suitable for your needs. Pure sine wave inverters (also known as true sine wave) are more suited for sensitive electrical devices such as Battery Chargers, Computers, laser printers, inductive devices (ballast, compressor, AC motor), variable speed control devices and audio equipment.